Learning the basic terms of a mortgage can make the process a lot easier. Buying a new home is full of excitement. Discovering the perfect 55+ neighborhood, mapping furniture placement, and the thrill of meeting your new neighbors are just a taste of what new homeownership has in store. But then you sit down with your mortgage broker, take a look at the contract, and it might as well be written in Latin. Understanding the basic terminology around mortgages is vital for new homeowners for understanding their rights, payment structure, and the value of their new investment. Here are common mortgage terms that will help anyone navigate the murky rhetorical waters of banker-speak. An adjustable rate mortgage (or ARM for short) is a loan that has a fixed interest rate for a short period of time. After that period of time (typically one, three, or five years), the interest rate is based upon an index. In the long term, an adjustable rate mortgage can be risky since the interest you pay is subject to the market. This type of mortgage is a great option for homeowners who do not plan on staying in their home for more than just a few years, since the rate for these years is usually lower than what one would get in a fixed-rate mortgage. APR for short, the annual percentage rate is the amount that the borrower will pay to the lender, usually determined as a percentage of the principal amount of the loan. Although the APR adjusts frequently, they usually range from 3.3% to 4.1%, depending on whether the loan is a 15-year or 30-year mortgage. Amortization is a fixed repayment schedule in regular installments over a specific period of time, with each payment going towards principal and interest. The estimated value of a home based upon a professional’s evaluation and an analysis of home values of the surrounding area. These valuations are conducted by a licensed appraiser who has passed the state’s licensing program. A mortgage that allows borrowers a low monthly payment for a specified period of time, typically from three to ten years. At the end of this period, the borrower must pay the remainder of the principal balance at once (referred to as a balloon payment). In some situations, the borrower can convert the lump sum into a fixed-rate or adjustable-rate mortgage. Most homeowners, however, either sell their home before the payment is due or refinance their loans. Equity is the difference between a home’s value and the amount remaining in the loan. Over a period of time, as the home’s value rises and the loan amount decreases, the equity in the home will increase as well. Homeowners can take the equity to finance a loan. Escrow is a strategy used when a buyer has certain conditions that the seller must meet before closing. The buyer will then deposit the payment amount for the house with a third party account, called an escrow account. This works for both parties as the seller is assured that the buyer can afford the house, while the buyer can ensure that certain conditions are met (inspections, renovations, etc) before handing the money over to the seller. After all conditions are met, the amount in the escrow account is transferred to the seller and the title is given to the buyer. Escrow is also used after the buyer takes ownership of the house and begins making mortgage payments. The lender will typically roll the cost of insurance and taxes with the monthly mortgage and hold that money in escrow. Once it is time to pay the premiums, the money in escrow is disbursed to the appropriate companies, and the lender can rest with confidence knowing that the owner can afford the home. A fixed-rate mortgage, just like it sounds, is a loan where the interest rate remains the same throughout the life of the mortgage. A fixed-rate mortgage is so common that it is often called a “vanilla wafer” mortgage loan and typically lasts for 15 to 30 years. Although the interest rates for fixed-rate mortgages tend to be higher initially, it is not subject to market conditions like an adjustable rate mortgage and is highly favored for borrowers who don’t like risk. When a borrower defaults on their loans, the lender can claim interest on the home and sell it at a public auction, applying the proceeds to the unpaid mortgage debt. The process begins when a borrower has missed multiple payments and is given a Notice of Default (NOD). The borrower then has the option of either negotiating with the bank, paying the amount needed to keep ownership of the home, or selling their home for less than the principal amount of the mortgage, called a short sale. A good faith estimate (or GFE) is the estimated closing costs that the lender must provide the mortgage applicant within three days of the mortgage application being submitted. The Good Faith Estimate can help the applicant to compare different offers and understand the monthly obligations associated with the loan. This is a fee charged to borrowers who pay off a loan faster than the agreed-upon schedule. While some penalties can add up to thousands of dollars, most states place limits on prepayment penalties. The penalty rate is often set between two to four percent of the loan. This is a home loan that originates as a fixed-rate mortgage but is followed by one adjustment. This adjusted rate can either replace the original rate for the remainder of the loan or the borrower can opt for an adjustable-rate mortgage. 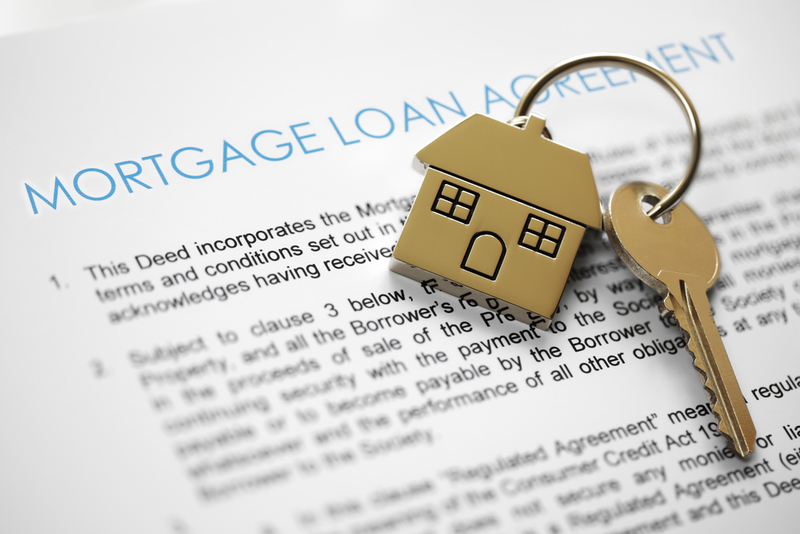 The two-step mortgage is often referred to by a set of seemingly unrelated numbers – 5/25, 7/23, 2/28, for example. A 2/28 means that the original rate will be effective for two years, adjusted, then locked in or transferred to an ARM for the remaining 28 years of the loan.